This condition particularly affects the hands, feet, wrists, ankles and knees -and tends to occur symmetrically. That is, if your right big toe joint is swollen and painful, chances are, your left one is too. But RA can also affect other organs. As well as joint pain and stiffness, symptoms include muscle aches, anaemia (a low blood count, leaving you feeling tired) and fever. The stiffness tends to be worse in the morning and after rest. Women are three times more likely than men to get it and it tends to affect people between the ages of 30 and 50. The severity of the symptoms vary from person to person. According to the Arthritis Research Campaign. About 1 in every 20 will have RA that becomes progressively worse leading to severe damage in a lot of joints while around 1 in 5 will have mild RA that causes few problems, beyond a little pain and stiffness. 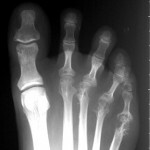 Front of the foot The metatarsal-phalangeal joints are often affected (where the long bones of the feet meets the toes), and can result in Hallux valgus (a condition in which the big toe is angled excessively towards the second toe) and hammer toe deformities (where the toes curl up in a claw-like shape). 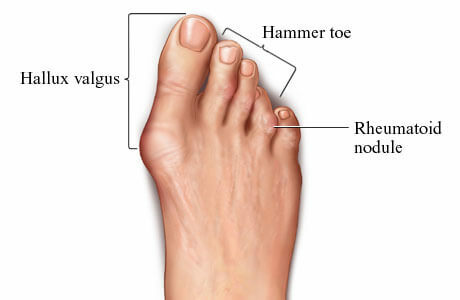 Each of these deformities can cause further problems, for example, if you have hammer toes, you'll be more likely to develop corns on the tops of your toes. 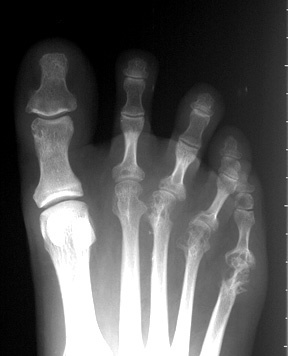 Midfoot If the joints in the middle of the foot are affected, the arch can collapse leading to a flatfoot deformity and spreading of the forefoot (where the front section of the foot becomes wider). 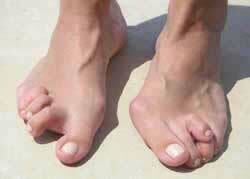 The fatty pads on the balls of the feet may slip forward, causing pain on the balls of the feet and backs of the toes. If this happens, it can feel as if you are walking on stones. Back of the foot If the joint where the heel bone meets the ankle (the joint that lets you rotate your ankle) is affected, it can lead to a condition known as valgus hindfoot (where the heel bends outwards), making it difficult to walk. Any kind of foot deformity will cause an uneven distribution of pressure as you walk, making you more likely to develop corns, calluses and ulcers. You may also get rheumatoid nodules - fleshy lumps that usually occur below the elbows but can appear on the hands and feet too. They may form over bony areas such as the heels and occur in 30 to 40 percent of people with rheumatoid arthritis. Orthoses These are a special type of insole that can be fitted into your shoes. They will help you walk in such a way to minimise the pressure on your affected joints. Shoes As well as a moulded insole, your podiatrist will help you find shoes that are roomy enough to accommodate your foot - and orthoses - without adding unnecessary pressure. If your toes are beginning to stiffen or curl, for example, it's important for you to wear a shoe with an extra deep toe box. Your podiatrist may make a plaster of Paris copy of your foot, so a shoe can be tailored to your exact foot shape. Protective shields They can also provide protective shields for your toes or padding to relieve pressure and reduce friction. Surgery Surgery can correct any bunions and hammertoes caused by RA. If your joint cartilage has been completely destroyed and the joints in your foot have been dislocated to the extent that it's extremely painful to walk, they can be fused together (a process known as arthrodesis). This involves removing the joint cartilage (the substance that allows the bones to glide over each other). The bones are then held together with screws, plates or a rod. The bones eventually merge into one solid bone. Although this results in a loss of movement in that particular joint, it can reduce pain. Secondary problems Any secondary problems such as ulcers or corns that have been caused by foot deformities can also be treated. Download and view our joints arthritis information sheet (pdf document).